A.D.D. is a 46 minute jam. Clip 1 is the first 3 minutes. The musicians who create the music on IMAGINATION DOCTORS bring individual expertise on their instruments and in their craft to this collective project, called J.D. and the Sons of Rhythm. Bassists Tony Stefanelli and Kenny Cornelius share time on the second disc of IMAGINATION DOCTORS, with Kenny in the 46 minute jam. Guitarist Joe Popp adds his enormous range to the same jam, providing everything from vocal sounds to distant guitar wails, and Sons of Rhythm regular Sheldon Peterson adds his unique chords and tasty lines to the mix as well. Disc two contains the 46 minute cut sandwiched between two more typical J.D. improvisations. Deep Purple catches the group in a J.D. style rock review, having fun with leads and power chords amidst the spontaneous communication. Talking in Tongues finds Singer exploring a strange vocal-like guitar sound with Stefanelli and the rhythm section talking back. The move toward the generic accelerates. Each town fills with the same stores, enclosed in the same malls. Planned communities sprawl across acres. Radio stations play the same songs in every city. Somehow, the world seems to shrink. 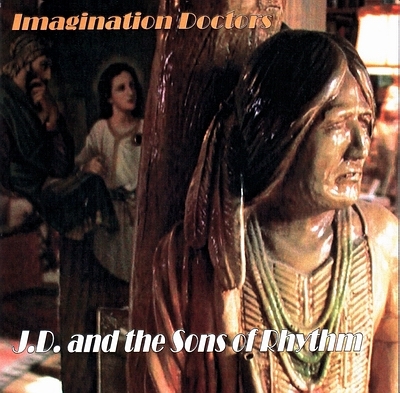 IMAGINATION DOCTORS, 13 tracks of music on 2 discs.